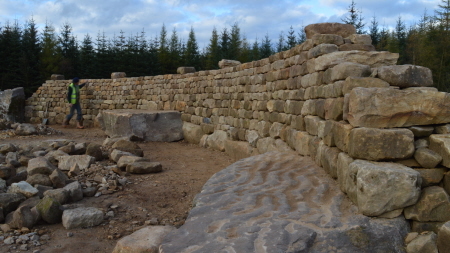 The Dry Stone Wall Maze in the heart of Dalby Forest. When finished, the outer most wall will measure eighty metres square, the walls will stand two metres high, consist of over 4000 tonnes of stone & take approximately three years to complete. Visitors will follow a short path through the forest to the maze entrance, which will be flanked by two enormous, ten foot tall standing stones. the waller’s craft, but also to conspire, mislead, hinder, challenge and assist visitors of all ages along their journey to the goal – the centre of the maze. Buy a stone with your initials carved into it, or those of friends or family: for a birthday, wedding or anniversary gift, or to remember someone special for all time. Your purchase supports the maze construction. 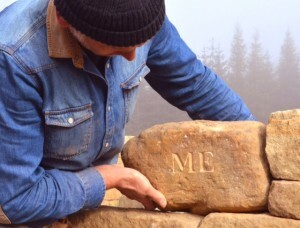 If you want to become more involved and learn how to carve your own initials into a stone, we are holding workshops in 2019, tutored by sculptor Peter Maris. 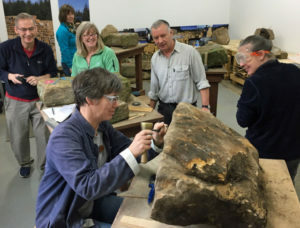 See stone initial carving workshop details here. The Dry Stone Wall Maze is a partnership project between Mark Ellis, Friends of Dalby Forest & The Forestry Commission.